Team Race Suits, Jackets, Warm-ups and More Unveiled this Weekend in Steamboat Springs and Park City. USA Nordic athletes will be making their home debut in Steamboat Springs and Park City over the next two weeks. Making the debut with them will be Podiumwear Custom Sports Apparel. "We are so excited to be partnering with Podiumwear. 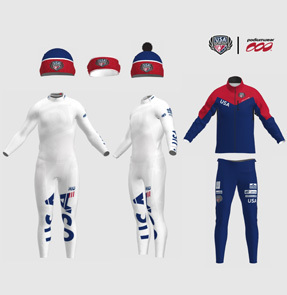 It's great to not only be utilizing a great American company but also to have the coolest race suits and apparel on the circuit," says USA Nordic Executive Director Bill Demong. Podiumwear Custom Sports Apparel manufactures custom apparel that functions in the toughest conditions and at the highest levels of competition. They work with clients to bring their unique design ideas to life, then print, transfer, cut and sew each garment to the highest standards. They do this for every single order no matter how small. All of their products are carefully crafted in St. Paul, Minnesota. Podiumwear Custom Sports Apparel is the leading manufacturer of custom nordic team apparel in North America. All Podiumwear products are designed, printed, cut and sewn with pride by a team of professionals at the Podiumwear factory in St. Paul, Minnesota. In addition to nordic skiing apparel, Podiumwear also manufactures team apparel for alpine skiing, cycling, running, ultimate frisbee and soccer. USA Nordic oversees ski jumpling and nordic combined within the United States. Their goal is to assist athletic excellence at the highest level of competition (Olympics, World Championships, World Cup, etc.) and to do so with Courage, Confidence, and Character.